Books, Bargains, Blessings: Tiny Prints Review and Giveaway! Tiny Prints Review and Giveaway! I recently wrote about how I love Tiny Prints cards. I have ordered different products from them over the years, and have never been disappointed! For my post, they sent me 50 Christmas cards. Here's what our friends and family are receiving this year! 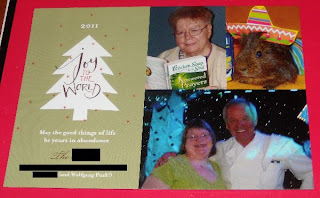 I loved this card because it could highlight the top moments for my mother, myself, and my guinea pig with having three photos on it. Another thing I greatly appreciated with Tiny Prints, is if you find a card design you like but you want a different amount of pictures, or the same style but a folded card or ornament card, you can often get the same design in a different style! Not only that, but they offer matching return address labels! They have a great selection of holiday cards. So if you're looking for Christmas, Hanukkah, or a more generic "Happy 2012" card, you will find something you will love there! And if you are reading this on November 9, be sure and check out the Tiny Prints Facebook page to find out how to get a FREE card for your little one! You will be able to chose one of these designs: Checking it Twice or Santa's Scroll. Personally I love the Checking It Twice card. What a great way to let your little one know that Santa knows what s/he wants as well as giving positive reinforcement for good behavior. The generous people at Tiny Prints have offered to give one of my readers 50 holiday cards of their choice. Ends 11/20 at 11:59 pm Eastern Time. Winner has 48 hours to respond after being contacted or another winner will be chosen. You MUST do the mandatory entry for your other entries to be considered. Follow me Google Friend connect. FTC disclaimer: I am receiving 20 address labels for this post. I liked Tiny Prints on FB (too soon for the free card; hope I remember). Tweeted the message once so far. The Merry Love ornament card is perfect for a new baby in the family!!!! I like the Merry Love Circle. I like the Photo Wishes card. Unique cards. I like Chic Tannenbaum. Ordered the free card today. Maleah will love it. Yhe Happy Santa is sooo cute! I love the blooming blossoms card...so unique! Oops! Missed the free card, but definitely would have sent it to my daughter to let her know Santa is looking forward to bringing her some surprises since she has been so good this year! Can you tell how badly I want to win this? :-) With a new baby due in less than 3 weeks, I'd love to have gorgeous cards to announce the birth AND wish everyone a Merry Christmas! Thanks so much for the giveaway! LOVE the Chic Sophistication card! I didn't see this until 11-12 so i didn't get a chance to get the free card. I would have gotten one for my husband. Banner of Dreams! We are using our engagement pictures on our Christmas cards this year and this one would be perfect. :) Oh- and it's doubling as a save the date card. I LOVE the Elegant Memories - so perfect for our family! I tweeted about the giveaway..
"Merry Love" card is sweet! I have loved the Tiny Prints things. My favorite is the count your blessings card. I LOVE the peppermint streamers photo card, how great is it that you could hang it as an ornament? I adore the Holiday Magic: White card! I love the Sweetly Sent: White cards! Thanks for the awesome giveaway! I would like the Around Christmas card. Love the Counted Blessing card. I ordered my card at that time! I love it! 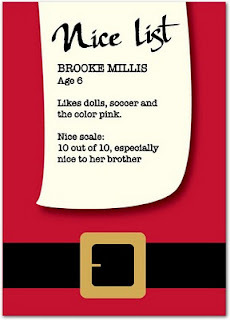 I liked the santa's list card! I ordered my free cards and am patiently waiting for them to arrive! Yes, there are so many great ones to choose! One of my favorites is Nostalgic Cutout, thanks for the giveaway! I like Tiny Prints on facebook (kellie conklin), thanks! I like Tiny Prints on facebook. Thanks!